Producer Hal Roach saw the decline of two-reel comedies early on. During the early 1930s his chief competitor in that field, Mack Sennett, struggled and eventually went bankrupt, while Roach had a plan to ease his "Lot of Fun" out of short subjects and into features, beginning with Pardon Us (1931), Laurel & Hardy's first long-form movie. That team proved equally popular in feature films, but attempts to transition other Roach favorites like Our Gang and Charley Chase didn't pan out and eventually Roach, who always aspired to make glossy, big-studio features out of his own modest company finally struck pay dirt with Topper (1937). It's a charming fantasy-comedy, aided greatly by its clever and well-executed optical and on-set special effects. Not only was it a huge critical and commercial success, it established Cary Grant, heretofore primarily a dramatic actor, as a star of screwball comedies (his second, The Awful Truth, arrived later that same year). Top-billed Constance Bennett likewise retooled her image from a clotheshorse star of melodramas, but Topper's impact wasn't as lasting. Finally, it helped refashion the screen persona of Roland Young, up till then best known for playing oily sycophants in movies like David Copperfield (1935), into a loveable, mousy type. His work in Topper won him an Academy Award nomination. Based on Thorne Smith's (for the time) racy 1926 novel, the movie stars Bennett and Grant as Marion and George Kerby, a quick-witted, super-wealthy married couple infamous in New York for their booze-fueled escapades. Smith's novel predates Dashiell Hammett's The Thin Man by nearly a decade, but the Kerbys are struck from the same mold as William Powell and Myrna Loy's Nick and Nora Charles. George is also the leading stockholder of the bank Cosmo Topper (Young) presides. At a board of directors meeting, George is bored senseless by Cosmo's stuffy reading of the annual report, but Marion feels sympathy for henpecked Cosmo, whose staid, image-conscious wife, Clara (Billie Burke) keeps him on a strict inflexible schedule and diet. She wishes Cosmo would learn to live a little. On their way home, George loses control of their speeding car, fatally crashing into a tree. The ghosts of George and Marion believe they're in some sort of limbo, a purgatory of punishment for their wasted lives until a good deed releases them to the Pearly Gates. Marion decides giving Cosmo a personality makeover is just the ticket. Topper's own escapades land him in court, on a drunk and disorderly charge, but this only improves his image with his employees at the bank, and with socialite neighbors who never invited the Toppers to their parties because they believed them resolutely straight-laced. Clara, not knowing what to make of Cosmo's strange behavior, believes he must have found himself a mistress, while Cosmo and Marion eventually wind up at the Seabreeze Hotel, causing enormous chaos and confusion for the hotel staff and their guests, especially when George arrives to reclaim him wayward wife. 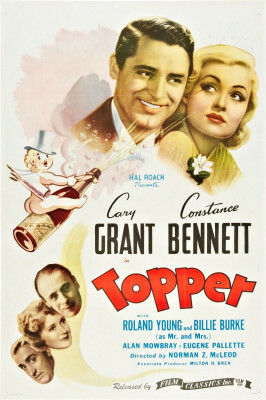 Those watching Topper nowadays are surprised by Cary Grant's second billing under Bennett, but it's justified. She has the larger role, with Grant absent for a big chunk of the film's second half. In the novel, Cosmo is more explicitly attracted to glamorous Marion, which is only hinted at in the movie, presumably a concession to the Production Code. The reason seems to stem from Roach's unhappiness with MGM's marketing and/or high distribution fees that made him less money on Topper than its box office would imply. His reputation concurrently suffered when he unwisely partnered with Vittorio Mussolini, Benito's son, which caused MGM much embarrassment. In any case Roach left MGM the following year, signing with United Artists for future films. From this point Roach took a sharp left turn into other kinds of moviemaking, notably Captain Fury, Of Mice and Men (both 1939) and One Million B.C. (1940), movies far removed from the kind of comedy in which, at least as a producer, he excelled. The head of Roach's effects department, Roy Seawright, was the company's secret weapon, and his optical effects are as ambitious and cleverly executed as John P. Fulton's more famous work on Universal's Invisible Man movies. Some of his and the on-set effects are so good it's hard to tell just how they were accomplished. In one scene an invisible Marion combs Cosmo's hair; I'll be damned if I know how they did that. Grant and Bennett are predictably charming as George and Marion, but the real fun is watching Roland Young's gradual transformation from mousy bank president to giddy, liberated husband, and for the film's supporting performances. Billie Burke, famous today as Glinda, the Witch of the North in The Wizard of Oz, excelled playing flighty society types such as this, and Arthur Lake, just before his signature role as Dagwood Bumstead in Columbia's Blondie series, performs some wonderful physical comedy as a bellhop confounded by the ghosts' behavior. Alan Mowbray nicely underplays the Topper's butler, while Eugene Pallette is fun as the hotel's beleaguered house detective. Ward Bond, Hoagy Carmichael (in his film debut), and Dorothy Christy (Stan's wife in Sons of the Desert) turn up in supporting roles. Lana Turner and Roach favorite Anita Garvin reportedly appear in bit parts, but I didn't spot them. VCI had some authoring issues on their concurrent release of another Roach movie, One Million B.C., but Topper, acquired through MVDvisual, has no such problems, the black-and-white film looking sharp with inky blacks and exhibiting little of VCI digital meddling. The PCM mono (English only with optional English subtitles) is clean and clear. The lone supplement is a long trailer, indicating MGM smelled a hit. Lots of fun for a variety of reasons, Topper is Highly Recommended.